Beebe Receives $1.1 Million from the Ma-Ran Foundation for Margaret H.
This gift was given by Peggy and Randall Rollins of the Ma-Ran Foundation to honor Karen Pickard, Program Administrator for the School and to recognize her leadership and the success of the School. The new Margaret H. Rollins Endowment Fund will support professional development opportunities for the Margaret H. Rollins School of Nursing faculty. 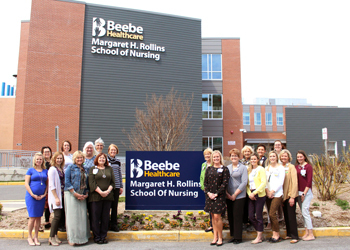 Beebe Healthcare announces a gift of $1.1 million from the Ma-Ran Foundation to create an endowment for the Margaret H. Rollins School of Nursing faculty. The funds will be used to support advanced degrees and professional development. The Rollins family has supported Beebe for more than 30 years. In 2011, Randall and Peggy Rollins donated $3 million through their Ma-Ran Foundation toward the expansion and naming of Beebe Healthcare’s Margaret H. Rollins School of Nursing, previously the Beebe School of Nursing. This project, completed in 2015, doubled the capacity of the school, and replaced the 50-year-old dormitory with a new three-story, 18,000-square-foot-building containing new, modern classrooms and state-of-the-art clinical laboratories. In 2017, the Ma-Ran Foundation’s transformational $10 million was the largest gift received by Beebe, largest in Sussex County, and one of the largest in the state. With that gift, renovations are underway on the Margaret H. Rollins Lewes Campus, and will include a more defined main entrance with a new lobby, a scenic corner at the east entrance, and renovation of patient rooms. The Rollins gift inspired many donors to join them in supporting the I Believe in Beebe Campaign to help fund the expansion plans. Other expansion on the Lewes campus includes the construction of a Hybrid Operating Room, an Electrophysiology Lab, and an additional Cath Lab. 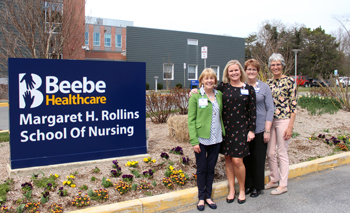 In 2019, Beebe Healthcare’s Margaret H. Rollins School of Nursing was named Best RN Program in Delaware by RegisteredNursing.org, which analyzes each school’s pass rate for students on the NCLEX-RN exam. The School is hosting an open house on Saturday, April 13, from 10 a.m. to noon – all are welcomed. “With this endowment fund, the faculty can continue their education, bringing innovative ideas to the classroom, and making the Margaret H. Rollins School of Nursing a destination for nursing students,” Pickard said. Learn more about the Margaret H. Rollins School of Nursing. Learn more about Beebe Medical Foundation. School of Nursing donation: Judy Aliquo, CFRE, President and CEO, Beebe Medical Foundation, left, with Karen Pickard, MSN, RN, CNE, School of Nursing Program Administrator; Tracy K. Bell, MS, RN, CMSRN, CNE, School of Nursing Program Coordinator; and Diane Barlow, Gift Planning Officer, Beebe Medical Foundation; pose together outside of the Margaret H. Rollins School of Nursing to celebrate the $1.1 million gift from the Ma-Ran Foundation for the Margaret H. Rollins Endowment Fund. School of Nursing faculty: The Margaret H. Rollins School of Nursing faculty poses with members of the Beebe Medical Foundation after the announcement of the Ma-Ran Foundation’s gift of the $1.1 million Margaret H. Rollins Endowment Fund for faculty to pursue advanced degrees and professional development. 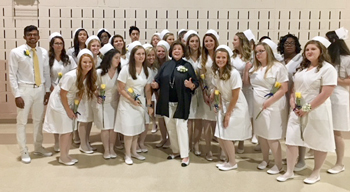 School of Nursing graduation 2018: The Margaret H. Rollins School of Nursing class of 2018 celebrates with Peggy Rollins at the ceremony. In 2011, Randall and Peggy Rollins donated $3 million through their Ma-Ran Foundation toward the expansion and naming of Beebe Healthcare’s Margaret H. Rollins School of Nursing, previously the Beebe School of Nursing.